Thankyou Linda for this Banner. I would say the most significant dream I have ever had of Michelle was in 1996. Michelle was a baby in that dream with two umbilical cords, one on her belly and one on her back. Since Michelle was struck on her back by the car this dream to me represented a significant message of hope: First born to this life on earth by the typical umbilical cord in front and THEN born to ETERNAL life, that of the umbilical cord on her back, where she was struck, (leading her to Heaven). Michelle and I were extremely close and I thank God that he and Michelle gave me the gift of this very special and poignant dream to be reminded of Eternal Life. I also thank God that I loved Michelle with all of my heart and being all of the days of her earthly life. 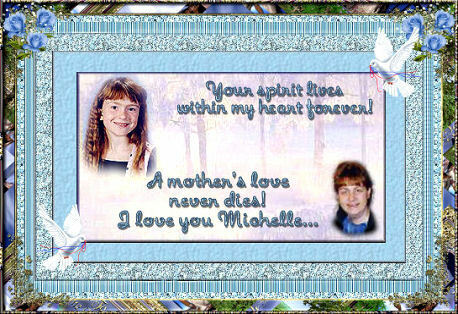 Michelle was a most loving, compassionate and giving child.."
The first dream is full color. It is summer out, a sunny and gorgeous day. I hear a baby crying and turn to see a small trailer parked out front by our water spicket. In the window I see a baby of maybe one year, sitting in a small plastic bath tub, on a table. I see Michelle steadying the baby repeatedly as the baby keeps trying to keep it's balance. Michelle picks up the baby and holds it in her arms like a mother and gently comes out and walks towards me, slowly and maturely, serenely. Michelle is wearing one of her favorite pink and white thin cotton summer dress with matching vest. She walks up to me as I walk towards her and we meet. I am SO surprised to see her and SO happy, I cry out, "Michelle, I have missed you since you died!!" She looks at me almost in disbelief and very puzzled, but sweetly, and she says, "Mommy, I didn't die!!" Melissa, Michelle and I are out and about in my car, as we so often were when Michelle was alive. All of a sudden my car slams into reverse, I can't stop it!! I ask Melissa to help me stop it, she says she can't!! I am looking "backwards" through the rear window of my car and I see that we are going to hit a dock! We are NOT going to stop!! We go over the dock and plunge into the water!! SUDDENLY my car becomes a convertible and I think it will sink BUT it floats JUST LIKE A BOAT!! So the girls and I are floating, we are ALL FINE!! It is a beautiful day and this dream is also in color. I look in the back seat and notice my Bible is taking on water but we are not sinking!! That is all I remember, we all lived through this!! Our entire family is back in California as we were in 1991, we are at the same hotel and I am happy to be able to wash our clothes, (just like I was back in 1991 when we finally got a place that had laundry facilities available!!) Anyways, this dream is in full color too and all of us are running around doing things. I notice then that Michelle is asleep, all covered up, including her head on the couch. When I see Michelle's body on the couch this scene is in black and white and misty looking. I walk towards Michelle and gently sit at her side. Michelle wakes up and uncovers her face, she turns to kiss me, and hug me. She tells me that she loves me and she is smiling sweetly, as she looks at me, she is calm and very happy. That is where this dream ends. ....My interpretations of these "water" dreams are In the first dream I could be the infant or perhaps Michelle is telling me that she is caring for infants in Heaven. I could be the infant as in Christ for I have not yet reached my completion for entrance to Heaven, another way to look at it. BUT either way Michelle is telling me that she is NOT DEAD!!! In the second dream I believe it means that even as I "look back" and try to change what happened with her death that I couldn’t stop the circumstances and Melissa couldn’t either!! Like Michelle is assuring us that there was NOTHING we could do!! And Michelle is also reassuring us that we made it and so did she, maybe she didn’t make it like we hoped she would on earth, in growing up and old but she made it in Heaven!! My car floating means I have conquered the grief and pain. That as we looked back there was nothing we could do to stop it! The water signifies spiritualness, in all three cases, first the water spigot and the baby bath filled with water, then the lake we plunged into, with my Bible getting wet, it means "saturation of God’s word" penetrating my heart, lastly the water from the washing machine to cleanse our clothes!! Always water! In the Bible they speak of "The Living Water" in John 4:10-14. It is beautiful....."But the water that I shall l give him will become in him a fountain of water springing up into everlasting life..." John 7:38 says, "He who believes in Me, as the Scripture has said, out of his heart will flow rivers of living water." 1st John 5:8 says, "And there are three that bear witness on earth: The Spirit, the water, and the blood; and these three agree as one." Revelations 22:16-18 is very interesting to me because it reminds me of something else too, the manger Michelle made the night before she went to Heaven and when I asked her what the star on her manger represented she happily and quickly said, " The star of David!" So see how this scripture fits in with the water and the Star of David!! vs. 16: " I Jesus, have sent My Angel to testify to you these things in the churches, I am the Root and the Offspring of David, the Bright and morning star." vs.17- And the Spirit and the Bride say, "Come!" And let him who thirsts come. Whoever desires, let him take the water of life freely." And finally in the third dream where Michelle is asleep, to me it means that Michelle is resting happily but she takes the time to let me know she still loves me and always will! And though I may think she is just sleeping, she very much is "Aware" of me and her love for me and mine for her!! I feel comforted knowing that Michelle is letting us know in no uncertain terms that she and all the others in Heaven are very much alive in Paradise and that they love us and always will and that they are fine!!!!! I dreamt I was on a flight somewhere and was talking to the stewardess and telling her about Michelle...I began to show her pictures of our children and then spoke about Michelle, somehow... in this dream, and yes I know it's going to sound strange ~ I had Michelle to show her Michelle, I picked her up out of the box and proudly gave her to this lady and I remember her auburn hair glowing in the light, I was so proud of her... Michelle appeared alive, and she was happy and acted JUST LIKE someone we know to be alive, she was acting like she was alive, and I said to the lady, "See, she was declared brain dead and she died and I started to count the months it had been... but I said to her, she is like she is alive!" Actually I myself was amazed as I explained to her, and I sensed she didn't believe me that Michelle really had died, but I wasn't sure... I told the lady who was a stranger to me that this was my little girl, my Michelle, I remember holding her hand up and adoring her tiny little self, she had been 9, I told her, when she died but in this dream she seemed to look like a three or four year old, her hands were as small as a babies! I then noticed Michelle's eyes were brown, I told the lady that Michelle's eyes used to be green. Michelle was even able to eat. I sat Michelle down on a chair as she had been running about and I scooped her up and sat her down, then she said to me very matter of factly, and like an older person with much wisdom... "Mommy... I want you to know that I can hear everything you say... I can hear everybody always Mommy... I love you very much Mommy, I love you all very much!!! Remember that, and I know you all love me too..."
Then I proceeded to brush my teeth and had the wrong toothbrush, it was a huge gold toothed toothbrush, almost like a metal brush for cleaning but flatter and smaller, I had fumbled for what seemed hours for the right toothbrush from my purse and finally found the right one and brushed my teeth. We boarded this plane that was rickety in appearance, it was night, the walls of the plane were made of wafer board and it was seated like a school bus, the front of the plane was nice and elite as conventional planes usually are where the cockpit was. We started to roll down the jetway and go up, I ran to the back of the plane to ask where we were going, the kids said different things, it was all students, Melissa was there but she herself wasn't much help to me, there was alot of confusion on my part though the students appeared comfortable and happy.. Suddenly we started to nose dive straight down, we came to a surprising bumpy landing but nothing bad happened, we started to roll in on the runway, a student said he would ask his dad nearby, who was working with wafer board where we were going, but instead the plane rolled by him and other workers and we started to ascend again. I never did find out where we were going but this was to be the second stop to take us to our destination and it was close by, a short journey..
Later I dreamt that we were near our home and there were railroad tracks next to it with a path for people to walk, I saw two men skating by through the fence and brush and trees, they scared me so I ducked, they were on the tracks, I was on the path next to the tracks.. I saw them disappear and was amazed this track and path was right next to our property as I had never seen it before.. Not too long later, I saw my mother, she was walking towards me in the opposite direction and just as our eyes met and we embraced, I turned and there was a juncture in the path with a bridge above it and out came my sister and her husband Brent with their baby in a stroller, mom stopped and said nothing as we then joined them too..
Next thing I knew we all found ourselves at a large open outdoor type festival, there were stages with wooden planked floors and at one to the right was a man handing Michelle a very large cluster of purple grapes, there were so many they were falling about her and she couldn't catch them all but she did walk to the back of the stage to the center of it and sit down holding one large cluster of grapes which she fed herself, at first her mouth bulging with them and then placing them one by one in her mouth more carefully.. I was amazed at what I saw, my tiny daughter as though she were alive once again and she was but she was brain dead and I knew it in my dream... Michelle said one more thing to me in a voice of wisdom again, she said "Mommy I have some more things to tell you..." she then looked away and said, "Now as for Melissa and Mark, they will be divorced.." she then acted like she was going to say more and she said not one more word.. I was hoping she would. I never thought it would take me this long to explain this dream but now that I have I am puzzled by it, it is most unusual don't you agree? The comfort I find in it has to do with Michelle letting me know she hears us all and she loves us all very much.. Then this morning there was an email on my mail that was about a little boy whose pet was put down because it was in pain and dying and the little boy surprised the vet by saying something the vet would never forget, he said... "I know, people are born to learn how to love and pets already know this so they don't live as long..."
I had a dream last night about Michelle and a HUGE flock of seagulls ~ it was SOOOOO sensational...I dreamt I saw a HUGE flock of seagulls, I mean the largest flock of birds I have EVER seen in my life.. The flock was so large that it covered all the sky as far as I could see...as I looked at them in amazement, my spiritual side told me that this was the flock of seagulls from 1993 and they were migrating and that Michelle had seen them in 1993 for the last time, now they were on their way elsewhere for the winter, as I looked at them in wonder, it touched me DEEPLY that these were seen by Michelle...I HAVE NO IDEA what this dream could have meant, can you help me with this?? IT touched me deeply and when I awoke, which seemed seconds later, I was just totally enthralled in this dream, the birds were all brown looking in their great numbers... I know they don't migrate here anyway, but in my dream they did and it was fall, what year I am not sure.. But I believe it was late fall 1993 right after Michelle had died when this took place in my dream. 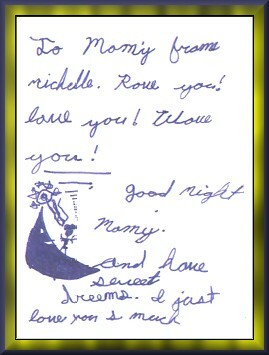 "Have Sweet Dreams, Mommy, I just love you so much..."
Those were the last words Michelle wrote to me days before she parted for Heaven. As this picture she made and her note show, above. I have thought of the over-all meaning of my dreams in general. Michelle is saying that even though she didn’t survive in the flesh, she is very much alive "ON THE OTHER SIDE." We as her family have have survived this, even in looking back we couldn’t change anything but we survived! In one dream the "infant" Michelle is caring for is the innocent person who hasn’t yet completed their earthly life. It could be me, or anyone she loves and "cares" for. Michelle is reminding me that she is not dead, just as the last Bible verse she memorized in John 10:28-29 says: "And I give them eternal life and they shall never perish..." Michelle is clearly illustrating her SUPPORT for us to GO ON, not give up! In another dream I get the message that even as I look back no one, including myself could change what happened, (Michelle’s physical death.) But we all survived the tragedy, Michelle being born to eternal life and us being able to survive here on earth. In one dream it ends literally with my Bible being "saturated" in my car as it stays afloat!